The winners of the 2017 Loudoun Outstanding Volunteer Award pose on stage. 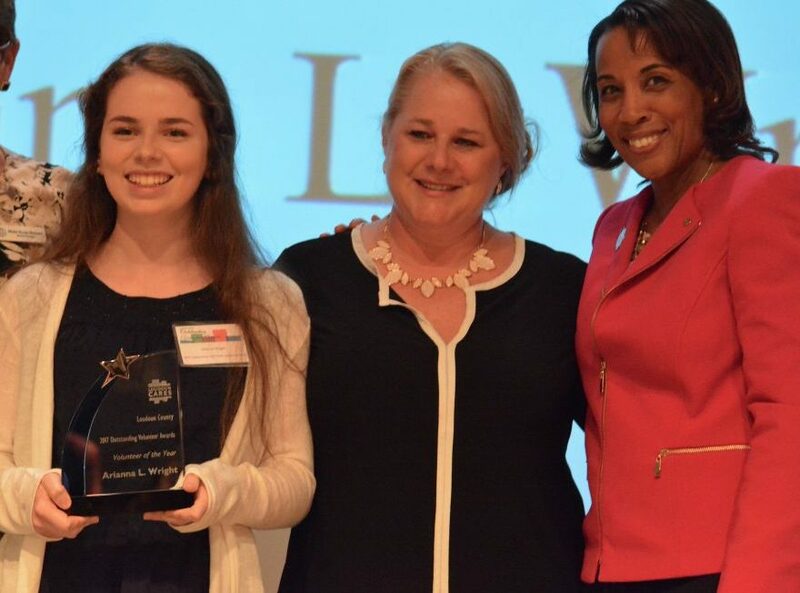 Last spring as an eighth grader at Smart’s Mill Middle School, Arianna L. Wright help launch a Girl Scout project to reinstitute child safety seat inspections to help Loudoun parents. Since then, the resulting Saving Loudoun’s Little campaign has ensured that more than 400 seats were properly installed in vehicles. On Friday night, Wright’s work was recognized as the county’s top volunteer effort. 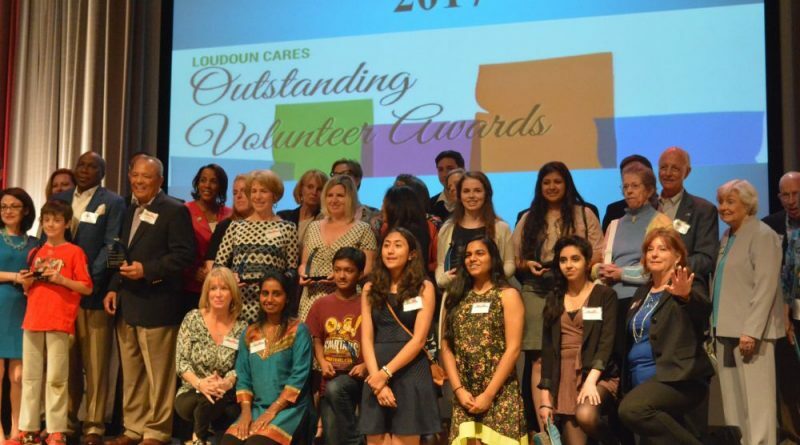 Loudoun Cares reestablished a county tradition by hosting the Outstanding Volunteer Awards program, after a three-year hiatus, at West Belmont Place in Lansdowne. More than 80 nominations were made in 15 categories. County Chairwoman Phyllis J. Randall (D-At Large) provided the keynote address at the ceremony. She urged leaders of community support organizations to accurately communicate their needs to the Board of Supervisors, and to closely follow what goes on in the board room and help guide supervisors’ decisions. She acknowledged the value of the work that Loudoun’s nonprofits and their volunteers do each day. “I want to say thank you for meeting people at their needs when they have health problems, when they have substance abuse problems, when they have family problems. When all their fight is gone and there is no one to fight for them but you—you fight for them,” she said. The awards ceremony was last held in 2014. 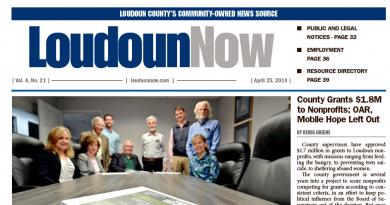 After that, a reorganization of the management of the county’s nonprofit outreach and support efforts resulted in the functions of several agencies being merged into the operations of Loudoun Cares. Wright was recognized as the Outstanding Youth Public Safety Volunteer and then was awarded the evening’s top prize as Volunteer of the Year. During the past year, Wright has devoted 600 hours of volunteer time to help organize car seat inspection events and secure training for more than 50 nationally certified safety technicians. Arianna L. Wright, with mother Sharon Wright and County Chairwoman Phyllis J.Randall, was presented the Volunteer of the Year Award. Outstanding Adult Volunteer: Barbara Tulipane, who works with O.A.R. to advocate the rights, services and needs of inmates at the Loudoun Adult Detention Center. Outstanding Adult Volunteer Team: Mosaic Virginia volunteers, a group of 25-30 volunteers who contributed 2,700 hours while helping to serve 500 clients in 2016. Outstanding Adult Project Volunteer: Kia Barker founded It Takes a Village Baby! to provide free diapers to more than 700 families. Outstanding Adult Public Safety Volunteer: Jim Cook serves as chief of the Leesburg Volunteer Fire Company and manages the county government’s Volunteer Battalion Chiefs program. Outstanding Senior Volunteer: Anne Wohlford devoted nearly 500 hours at the Senior Center of Leesburg as a front desk agent and concierge, fitness instructor and café team leader. Outstanding Senior Volunteer Team: A team of 42 volunteers operate Falcon’s Landing Delivered Meals program who join up each Thursday to help the Area Agency on Aging transport food to, and check in on, clients on four routes around the county. Outstanding Volunteer Family: The mother and son team of Kamala and Mitesh Shrestha has been active with Loudoun Volunteer Caregivers since 2013. During 2016, they contributed 120 hours delivering food from Loudoun Hunger Relief to homebound elderly and disabled residents. Outstanding Volunteer Team: The Shocktober Crew helped raise more than $350,000 for the ALLY Advocacy Center on the Paxton Campus during the seventh annual haunted house presentation that hosted 12,000 visitors over 15 night of performances. Outstanding Volunteer Corporate Team: Paul Davis Restoration contributed more than 250 hours to help the American Red Cross, including helping to lead the agency’s door-to-door home fire safety campaigns throughout Loudoun. Outstanding Volunteer Club or Organization: Epsilon Zeta Boulé Foundation organized the Salute for Service 5K race that raised $22,000 for the Loudoun Homeless Service Center and Mobile Hope, and contributed $6,000 to a Thanksgiving Day of Service that helped more than 1,000 Loudoun residents. Outstanding Volunteer Project: Loudoun Live was a day-long music festival that raised funds for the United Way’s Loudoun County Impact Fund and awareness for its participating community organizations. Organizers Amy Bobchek and Ara Bagdasarian are working on a similar benefit concert to be held this fall. Outstanding Youth Volunteer Team: The Youth Advisory Council is comprised of 71 high school students who work with community, government and business leaders to provide their peers with support programs and to encourage community service, healthy living and diversity. Their programs include a Loudoun Youth Day of Service, the Step Up Loudoun Youth Competition and the Youth Fest Battle of the Bands. Gabriella Miller Youth Volunteer: As an American Red Cross volunteer, Varsha Kakaraparti has organized donation drives that collected about 850 pints of blood. She also served as the Youth Team Chair of the agency’s Blood Drive and Marketing Committee. The award is named in honor of Gabriella Miller, the Leesburg girl who inspired nationwide giving to the Make A Wish Foundation before she died from an inoperable brain tumor at age 10. Her mother, Ellyn Miller, presented the award.